If you're looking for water parks in or near Pittsburgh, consider visiting Sandcastle Water Park. 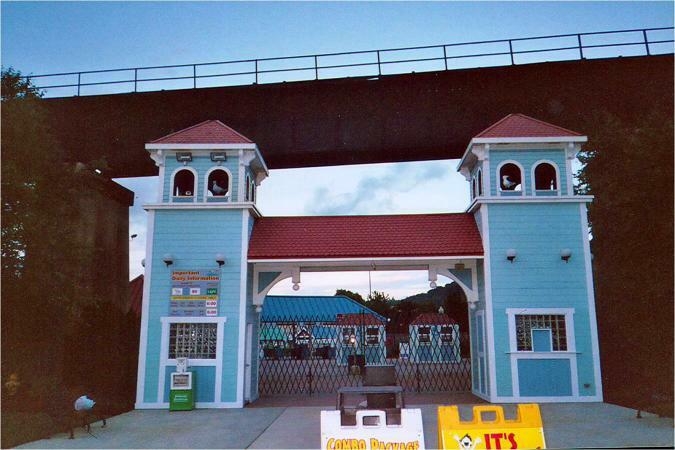 Located adjacent to a boardwalk overlooking the Monongahela River, Sandcastle features 15 water slides, a lazy river, and two children's play areas. Sandcastle Water Park offers plenty of attractions to keep both adults and young ones busy. Ride one of the exciting water slides, relax in the lazy river, or splash with your kids in the child's play areas. Some rides do have a height requirement (48 inches or more), and require riders to be capable swimmers. Blue Tubaluba: This tube slide was Sandcastle's first dual-rider enclosed slide. You'll experience misters, waterfalls, and total darkness along two 450-foot slides before landing in a four-foot-deep pool. Dragon's Den: The park's newest tube slide takes riders through darkness, then plummets them into the mist-shrouded abyss of the dragon. Aside from the height requirement, the combined weight of riders cannot exceed 400 pounds. Mon-Tsunami: This is a 20,000-square-foot wave pool, including diamond waves that crisscross the 300,000-gallon pool. The deepest point of the pool is six feet. Guests under 48 inches must wear lifejackets and be within arm's reach of a parent or guardian. Lazy River: The lazy river's gentle current takes you a quarter-mile along the river and under some slides. There are single and double tubes available. Tad Pool: One of the two children's pool areas, Tad Pool is designed for parents to help kids ride their first water slide. It's only two feet deep, with two slides and lots of wading room. Kids here must be under 42 inches and a parent or guardian must be close by at all times. You can rent cabanas for the day as well. These are 10' x 10' and come with four lounge chairs, four chairs, and a table. Cabanas are located by the Wave Pool, Wet Willies, or the boardwalk that overlooks the Mushroom Pool. Cabanas start around $60, hold eight people, and can be reserved online. There is an additional fee if you plan on having more than eight people. There is also a premium cabana option that offers great views and accommodates up to 15 people. These start at around $100. All American Grille: Get a variety of grilled foods like hamburgers, hot dogs, and chicken. Potato Patch: Visit this popular Pittsburgh spot to grab fresh-cut fries and toppings. Snacks: There are snack places like Icee Mix It Up and Dippin' Dots. Sandbar: Enjoy frosty frozen beverages or chilled beer. It's important to note that while Sandcastle would like to ensure that food is free of allergens, there may be trace amounts of nuts, dairy, egg, soy, fish/shellfish, or sesame seeds. Those who have concerns should consult with a manager on the day of their visit. Outside food and drink is generally prohibited, except for small-sized snacks in portioned sizes and unopened water bottles less than 20 ounces. Sandcastle is only open from the end of May through the beginning of September. Most days, they are open from 11 a.m. to 6 p.m. On opening and closing weekends, they are open 11 a.m. to 5 p.m. On a few Saturdays in July and August, the water park is open until 7 p.m. If you're driving to Sandcastle, take I-376 to Exit 5 towards Homestead. Take the exit ramp off the Homestead Grays Bridge and then continue straight on Sandcastle Drive. The water park is located next to the Waterfront shopping and entertainment complex. Regular parking is available for about $7 per vehicle, per day (cash only). There is also a preferred parking option that is available for a few dollars more, which is also discounted if you get a season pass for parking. Sandcastle offers single-day admission tickets as well as various season passes. General admission is around $35 when purchased at the gate. Any tickets or passes ordered online are subject to tax and a service charge. For those who are interested in visiting Sandcastle multiple times a year, there are four season pass options. All the pass levels offer various discounts on retail purchases, cabana rentals, and locker rentals, as well as discounts when visiting sister parks. Silver Passes (must purchase two) are about $50 each. Gold Passes for around $60 include the option to bring a buddy for free on weekdays and a $10 buddy ticket on other days. Premium Passes are about $80 and include the ability to bring a buddy for free any day, as well as a souvenir cup, parking, and $10 buddy tickets. Ride & Slide Passes for around $115 come with the same free buddy weekdays, parking, and buddy tickets as above, as well as many more sister park discounts. Season passes can be paid off in three payments if you prefer. Season dining passes are available for about $60 and are valid at participating locations for one combo meal for every visit during the summer season. Restaurants like All American Grill, Pizza Hut Express, Potato Patch, and Uncle Tony's Pizza are included. They are not valid for Chick Fil-A, Snack Shack, Funnel Cake Factory, and Dippin' Dots. There are various group sales options for admission tickets and some meal tickets. There are also combo packages that include catering. Contact the group sales office at 412-461-3694. Sandcastle hosts birthday parties with packages for 10 people; you can add additional people for a fee. Birthday parties are two hours and held either from 12 p.m. to 2 p.m. or from 3 p.m. to 5 p.m. Unlike some parks that don't allow outside food, you are allowed to bring birthday cakes for a party, but note that they don't provide plates, utensils, or candles. Check their website for potential deals and discounts. For example, you may find the holiday fun sale that gives you $5 off the Silver Season Pass or a general admission ticket and meal deal for around $25 for four or more tickets. Other places to look for discounts include local Giant Eagle stores and on the sides of Pepsi cans in the area. Unlike some water parks, Sandcastle offers a "Great Weather Guarantee." If pools and water slides are closed due to bad weather and you have your ticket stub or receipt, they will issue you a free admission ticket for a visit at a later date. Sandcastle has a pretty strict dress code, so familiarize yourself with what's appropriate and not appropriate in the park and on water slides. Lockers are available for rental if need be. Personal photography is allowed, but you cannot bring in drones, take photos that may violate other peoples' privacy, and use selfie sticks. If you want to take any commercial photography, which includes a laundry list of scenarios, you must obtain prior written consent from the park's owner through a contract signed by an executive within their corporate office. Reviews last season were mixed, with a number of TripAdvisor reviewers noting that the park is in need of some maintenance and updates. Multiple users noted lots of weeds, some broken chairs, and chipping paint. Others complain about lackluster food options, so consider bringing food and eating on the picnic tables outside of the park. Other complaints seem to revolve around attractions not opening when the park did. Several people said the park opened at 11 a.m., but some attractions opened at noon, while one user noted the lazy river didn't open until 1 p.m. the day they were there at the end of the season. Lines for the lazy river sound like they can get long, especially on peak days. The lazy river is a little too lazy, as noted by some. This causes backlogs, and some lifeguards were pushing people along. Consider going in June when it's less busy, or on a Tuesday or Wednesday, which they note are their slowest days. Consider booking cabanas online and in advance. These can sell out quickly, so don't wait until the day of if you know you want to reserve one. Make sure you check the weather before you go - especially if you don't live in the area. In 2017, the park suffered severe flooding, which forced closure of the park for nearly a month. And, even when they were able to reopen, some attractions were still closed as they worked on clean-up efforts. News reports indicated that the lower level of the park went underwater from the Mon River overflowing. If you have kids and plan to visit on a non-peak day, Sandcastle can be a fun day for the entire family - especially if you can score discounted tickets ahead of time. Is it worthwhile for families visiting Pittsburgh from out of town, or for people driving several hours in each direction? It's really a subjective choice on what your expectations are. If you're looking for a fun water park with some cool rides, you're likely to have a great time. If you're hoping for a mega-sized water park with advanced technology slides, you may be disappointed.